Those who know me well know that I am a very deliberate and conscious about my impact on the environment. I eat mostly organic, I avoid processed foods, I never eat fast food, I buy as local as I can, I've been recycling since I was nine, which also the time around which I started cutting the soda can plastic rings to save ocean animals from strangulation (back then they still dumped garbage into the Hudson River). I am part of a committee that is starting up a food co-op in my neighborhood so we can have access to local, sustainable and healthy food, I walk or take public transportation when I can, and ride my bike for farther away errands. I try to use as many biodegradable cleaning products as I can as well as recycled products, and I rarely buy packaged food to avoid throwing out too much trash. Basically, I am an environmentally conscious person in almost every aspect of my life. This epiphany came to me while I was reading an article in Newsweek about China's new initiative to start mining around deep sea vents. The article describes the unique ecosystems that thrive around these vents. 1,300 new species have been discovered in these ocean communities since 1977. 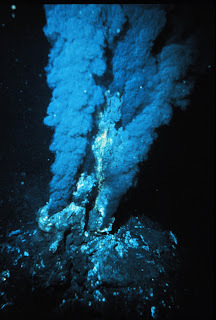 The vents, which spew seawater as hot as 750 degrees Fahrenheit, create massive mineral deposits. The seawater that leaves the magma under the ocean floor brings with it melted minerals that cool and harden as they hit the cold ocean water temperatures. One of these deposits, according to the article, is 600 feet across and 120 feet high. Inside these deposits are minerals and ores like copper, gold, silver, nickel and tellurium, which is used to make computers, CDs and DVDs. As I read this, I began to think about all of my gadgets, my 2 laptops, my phone, and all of the processors that run nearly all electronics these days. In all of my attempts to be environmentally friendly and conscious, my gadgets are the one place I have been slacking. I am pleased to know that my Macbook Pro is made of one piece of aluminum, but the processor and most of the parts inside are made in China. The last thing I want is for my love of gadgets and devices to cause the destruction of an ecosystem that is not only unique, but that also has provided microbes that enable DNA fingerprinting, and other biological compounds that could hold cures for diseases. Right now, China is in the process of exploring these vents in the Indian Ocean near Madagascar. Does this mean that we should ditch our devices? We don't necessarily need to stop buying new computers and cell phones, but we DO need to be more conscious of where and how they are made. We should make sure that our old machines get recycled, and that these materials that are so costly to mine are reused. We should also be making sure that we know where the parts of our devices come from. We should be pressuring companies to mine sustainably. I hope that, just like the consumer campaigns against Nike's sweatshops or against Congo's blood-diamonds, consumers will start demanding that their digital products contain sustainably mined minerals. Australia, one of the places that coltan comes from has already moved in that direction. Check out the sustainable mining conference that happened just this summer.